This inscription is on the Town Hall in St Aldate’s. 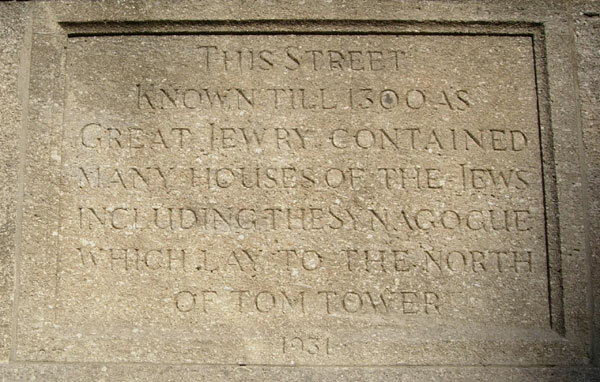 Before 1300, Great Jewry ran from Carfax to Folly Bridge, and many of the houses were owned by Jews, although some of them were let to Christians. There were also Jewish houses in adjoining Pembroke Street (formerly known as Pennyfarthing Lane) and Brewer Street (formerly Lombard Street). 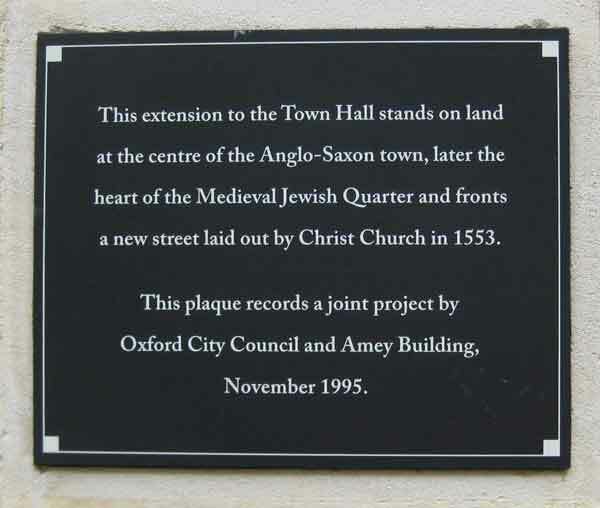 The Town Hall itself is on the site of the house of David of Oxford, a financier, and on his death in 1244 it was presented to the Domus Conversorum, the “home for converted Jews”. This inscription is on the back extension of the Town Hall in Blue Boar Street. a new street laid out by Christ Church in 1553.